Jan 4 2018 - Three pictures in this paper yesterday depict the utter callousness with which we have degraded our natural resources because of greed and indifference. The front page shows a horrific pile of rubbish in an area in Keraniganj—an earlier picture of the same area juxtaposed with it makes us realise with disbelief, that this garbage dump was actually a canal only a year and a half ago. It is hard to believe that once this pit of rubbish was a pristine waterbody running between rows of buildings, providing relief to the concrete jungle. Obviously, over this short period of time, there has been absolutely no oversight regarding illegal dumping of waste. So who is responsible for this ugliness that can be seen all throughout the country? In this particular case we would expect the city corporation to be the authority responsible. How could people dump garbage continuously in this canal without the city corporation objecting or taking action against the offenders? We have seen in innumerable cases, canals and other water bodies being filled up with garbage with the ulterior motive of grabbing that area. This is only possible with the collusion of unscrupulous elements among those who are responsible for preventing such dumping to occur. Another picture on page three shows the pathetic state of Surma river in Sylhet where again garbage has been dumped into the river threatening its aquatic life and also the health of humans living nearby. This shows a blatant indifference among the people and the authorities, towards preserving the environment. 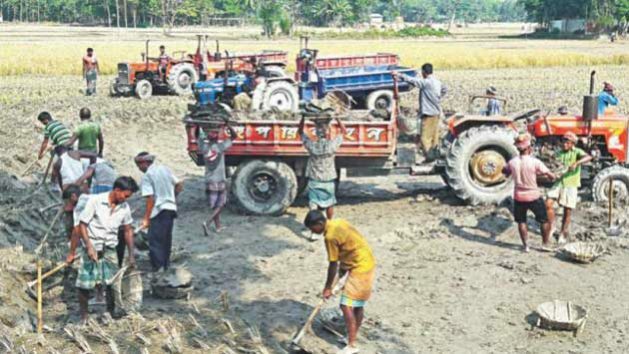 Yet another picture on page 13 shows the indiscriminate collecting of topsoil from farm land in Lalmonirhat for brick manufacturing, has adversely affected the land’s fertility and the environment. Despite knowing all the consequences why are we still on this self-destructive path? When will the environment, people’s health and preserving our natural resources become a priority for the government and the public? This is a question we have no answer to.